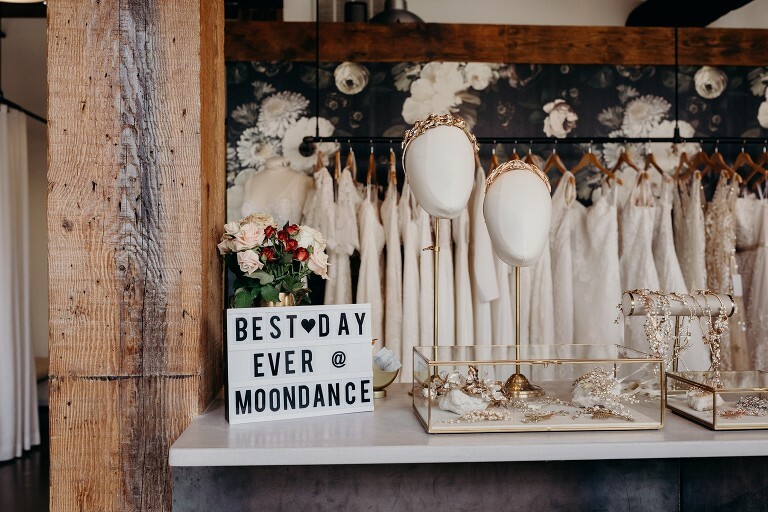 I heard a flutter of happy laughter the moment I swung open the door of Moondance Bridal. I planned this appointment weeks earlier to find my wedding dress, and I became stoked for this experience in a way I never really anticipated. Tall ceilings and a bright, happy atmosphere welcomed me into the shop where an excited bride-to-be had just found her dream dress moments earlier. The beautiful shop was effortlessly cool and full of dresses I had been drooling over for months. Danielle and Tawnya greeted my friend Ashley and me with friendly smiles and a glass of champagne for each of us. I was made to feel special the moment I arrived. 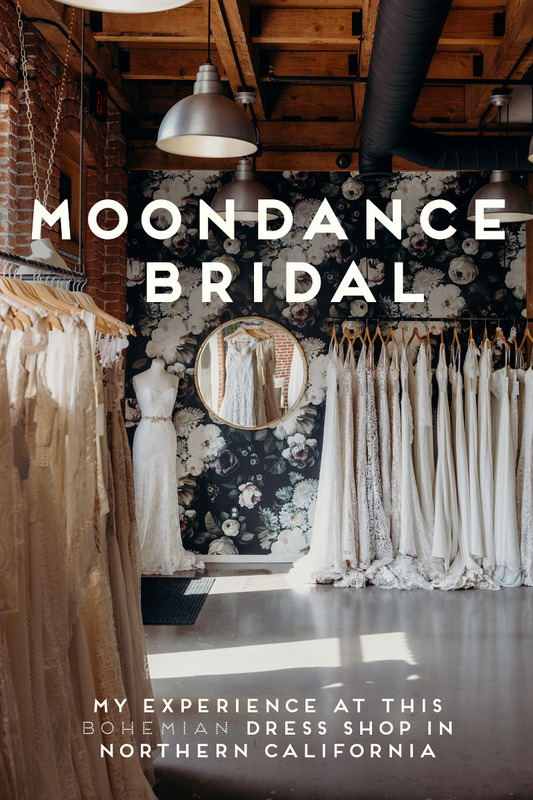 Moondance Bridal is a special wedding gown boutique in San Luis Obispo, California. The shop is also home to Untamed Petals bridal accessories. This blog post is a review of my personal dress-shopping experience there along with photos of the shop. I am not being compensated for this post in any way. I just love telling people about great businesses! I received so much personal attention during my 90+ minute appointment. More importantly, Tawnya seemed genuinely happy to help me find THE dress. We walked the racks of jaw-dropping dresses together and she asked me what kind of features and silhouettes I was drawn to. Moondance didn’t limit the number of dresses I tried on. They didn’t rush me. They didn’t expect me to know exactly what I wanted. The shop limits the number of appointments at any given time so that every bride gets their full attention. The associates there were happy to help me find just the right silhouette, fabric and cut even if it meant trying on 20 dresses. The experience was in stark contrast to my other bridal appointment experience at a different shop, where I felt rushed and unwelcome. My day at Moondance was truly an unexpectedly special experience. 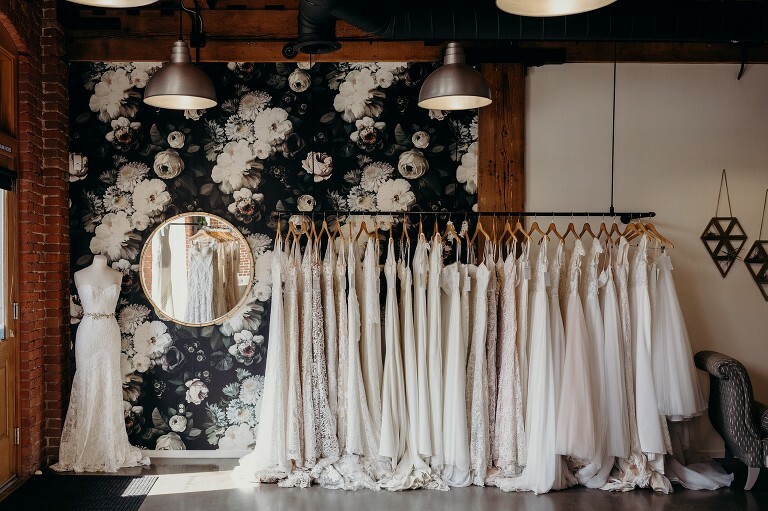 This shop really had a great selection for less traditional brides, whether you want to go full-on bohemian or more on the minimalist side of the laid-back bridal look. I was personally thrilled to be in a dress shop that wasn’t dripping with blingy gowns and poofy princess silhouettes. Another special thing about Moondance is that they carry some designers that are harder to find, like the bohemian Australian designer Rue De Seine (a designer I’ve been drooling over as a photographer for about a year). There are maybe 2 other shops in all of Northern California that carry that brand. But these rarer designers are complemented with some more familiar names too. And of course, it is the flagship store for the stunning bridal accessory line Untamed Petals. If you know me, you know that I was not the girl planning her wedding since she was 5. Not even close. I am a second generation wedding photographer, but I never gave a thought to what I wanted my wedding or wedding gown to be like before I was engaged. The dress shopping experience was something I didn’t give much thougt to until I discovered Moondance Bridal on instagram. I had seen A LOT of wedding dresses through my years of photographing weddings and never felt like I could see myself wearing a conventional dress. But Moondance had dresses that were right up my alley. They were all about the less conventional and free-spirited aesthetic. It was a dreamland of bohemian and romantic dresses. The first dress I tried on ended up being the winner, but I tried on probably 10-12 other gowns as well. Tawnya let me take my time to feel out each one and get feedback from my friend. She didn’t even make me feel bad about trying on a dress three separate times just to make sure it was the winner. I really felt like one of those annoying high-maintenance customers, but Tawnya assured me that she knew how big this decision was and that she was happy to help me. I was so happy to have found a dress that made me feel beautiful (not an easy thing!) and to check off this box on the wedding planning to-do list. After ordering the dress, the ladies in the shop sent me home with a cute little goody bag of treasures and a heart full of joy! Overall feelings: YES YES YES. The customer service was excellent, the ambience was stunning, and the selection of dresses was wide. If you’re a bride looking for something unique and more laid back than the big princess ball gowns, then I’d totally encourage you to schedule an appointment. This shop is worth the trip even if you live in the San Francisco Bay Area or the Monterey Bay. I traveled there from Santa Cruz and made a weekend out of it! Want to read more wedding advice and reviews? Check out these posts!